Being the face of your brand requires more than just a headshot! You need a cohesive look that really represents you and your business. You want it to be authentic, compelling and absolutely beautiful! Author/ ghost writer, Pam Walker is in the midst of having her new website designed. She reached out to me to help her bring her vision to life. We brainstormed ideas and combed through images online for inspiration. We made a list of props we would need to make this happen. On the day of her personal branding session, Hair & Makeup Artist Elly Baker was on hand to do her magic. While Pam was in H&MU, we started arranging the props Pam and I had collected to get some detail shots. In addition to studio strobe, we also took advantage of the day’s beautiful natural light for detail shots and Pam’s gorgeous portraits. Her love of turquoise, typewriters, the written word and her passion to help others tell their story were all woven together to create the images she needs for her website and business. And most importantly, Pam’s beautiful spirit really shines through her portraits. I can’t wait to she her new website!! It was such an honor to be a small part of bringing her dream to life. Homemade Goodness Delivered To Your Door! Meet Dana Pishotti, owner and chef extraordinaire of Soup (er) Delivery in Montgomery, Ohio. Her business makes Monday’s a little more magical and a whole lot less stressful by delivering to your home, fresh soup and bread. Everything is homemade by Dana and it is GOOD!! Each week the menu changes. I’ve always said that one of the most wonderful things about being a photographer is the people I get to work with! This holds true with Dana. We had a very enjoyable time in her kitchen photographing her at work. She even sent me home with some homemade goodies that Charlie and I enjoyed. More and more I understand just how important gratitude is to living a mindful and happier life! I want it to be the foundation of how I live, the lens I look at life through. As part of a personal gratitude practice, I have started a “Gratitude Journal” as a place to record daily things, people, events that I am grateful for. They can be small, easily overlooked things such as how wonderful my morning coffee tastes on a particular day or biggies such as how much I appreciate going through life with Charlie. This idea is to help my brain be more on the lookout for the good things that happen in life. I’m learning that my mind is trainable! I can develop skills to help me see the good that often goes unnoticed. Humans have survived all these centuries by being able to see danger and fight/flight/or freeze their way through it. The thing is that the primitive part of our brain that sees danger can be triggered by everyday stress or annoyances and react as if we our lives are threatened. Personally, I want to react less to the everyday annoyances and more to the everyday goodness in my life. This is in no way meant to downplay or trivialize difficulties or suffering anyone is going through. It is meant to acknowledge the good and the blessings that are here too. You are pregnant..you are powerful, you are bold, you are BEAUTIFUL…. I am SO very glad women show off their pregnant bellies now! When I was carrying my children, big flowy shirts and dresses where the style. And pregnant women certainly didn’t wear bikinis to swim! Wow, so glad times have changed!! The ability to create, carry, and give birth to new life is an amazing power we women have. It deserves to be seen, celebrated, and even hung on the wall as art!! This is a legacy portrait! 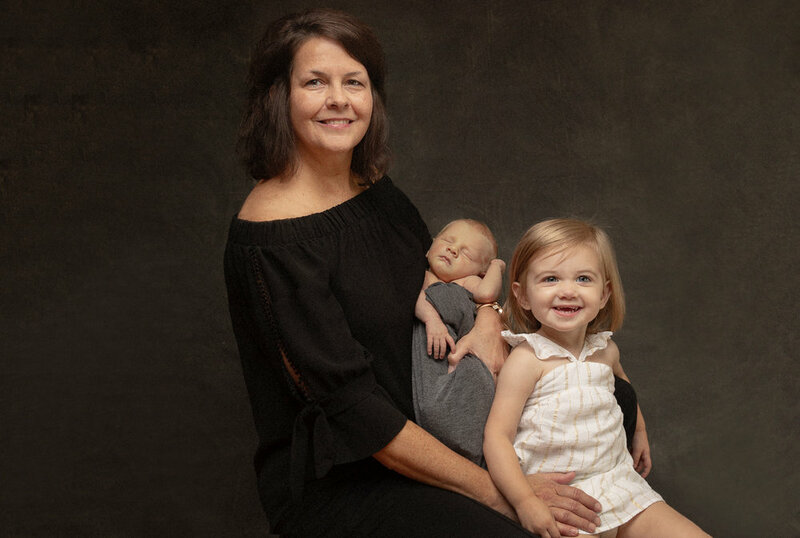 Laura with her grandchildren….you should see the fine art print of this….So Beautiful! One day when these little ones are grown, they will cherish this portrait with their Nana. Too often as women, we hide from the camera, especially as we begin to age and our bodies change. It is easy to forget that it is only if we are lucky, one day we will become grand old women. By loving who we are right now, we also send a powerful message to our children and grandchildren that you are ok just as you are too. How interesting that loving ourselves is the first step to helping others love themselves! !